You guys! That hanging bare bulb in my office closet isn’t just a safety hazard or code violation… it’s trendy chic! I just need to add a curlicue cage around it. Very trendy and adorable…. love it! LOVE this idea!!! SO chic! I’ve just realized that you’ve had your birthday already! Happy birthday Nicole! Thanks for a wonderful & inspiring blog :) God bless and enjoy your thirties! Bare bulb with cage around it=reminds me of ghost stories involving mental hospitals. Did you see http://www.copycatchic.com/2010/10/jayson-home-workshop-cage-lights.html yesterday? More options. Those are so cool. Those would be perfect options for the kitchen island in my parents beach house….hmmm. Thanks for sharing. These are too cool for school! The hardware is pretty killer. I kinda like them clustered, too — like a funky downtown chandelier. Agreed! 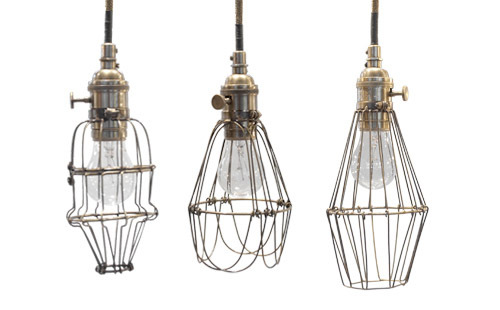 We’ve been searching for the perfect pendant lights like this to hang over our nightstands. Great find! Oh my gosh, these are so cool! I wish I had a hanging lightbulb that I needed to spruce up:-)! Hi Nicole. Great idea. I got my cage from ebay for $60. Much cheaper than the Anthro version. Oh! I love these so much.